Welcome back this beautiful Saturday morning! The weather here in Utah has been so lovely. With a new season comes more sunshine, and lots of pretty flowers. This is a time to shake off the winter and tackle some new projects. Just around the corner is Easter, so I hope to bring you some Easter inspiration to create for your special day. Tell the story of the photo. If you don’t love to have your journaling on the front of your layout, just flip it over and write on the back; it is just important to have it with the layout. This layout was created by Jen Evans for Heidi Swapp Inspirations. Jen used the new Wanderlust Collection and Heidi’s Minc to create her layout. To create these beautiful flowers, Jen placed the dies on the Minc’s carrier sheet, added the foil on top, closed the carrier sheet and ran it through the Minc. Done! It doesn’t get much easier than this. Jen curled the edges of the flowers to give them more of a realistic look. She also added the new Butter Color Shine to the large veneer word and add a bit of yellow ink to the flowers. How simple and yet so gorgeous. To find more inspiration on Heidi’s newest products visit Jen at Create Well Create Often blog. You will be so inspired with her talent and creativity. There is nothing sweeter in my eyes than a vintage style card. This card brings back so many memories of my childhood. (I guess I just aged myself with that one!) 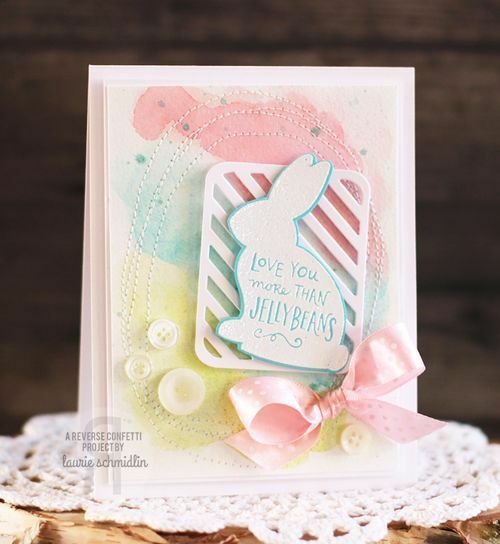 These adorable Easter Button cards are full of beautiful details, plus they are a digital download, which makes them so easy to get. What a wonderful way to take the time to express your love and affection to both family and friends on such a beautiful day. These cards can also be used for scrapbooking, any type of crafting, tags for gifts, a label on a homemade treat, or just add to your seasonal decor. 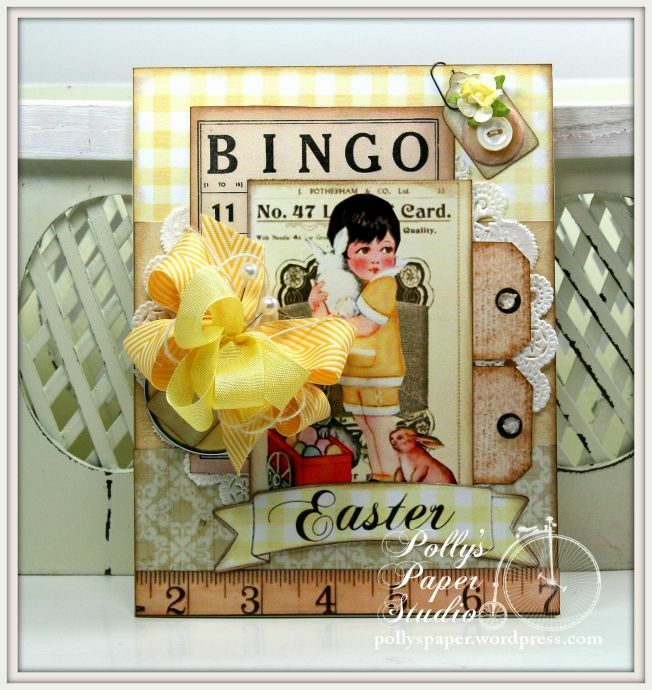 Ginny Nemchak created this adorable Easter card using layers of patterned papers, images from the Easter Kids Button Card Digital Collage, and fun embellishments. To finish her card she add a bow using Chevron Striped Twill, and Forsythia Seam Binding from Really Reasonable Ribbon. Thank you Ginny for your inspiration along with sharing such an adorable Easter card. You can visit her blog Polly’s Paper Studio for more of her wonderful projects. I just love how this design is one of the latest trends. Combining a stamp with a coordinating die set is so fun to do. And don’t you just love the watercolor wash over the background? Once the watercolor wash was dried, Laurie spritzed on some light aqua spray, then added some messy stitching to her background. This gives the card some added color, along with giving it that fun mixed media look. I am always amazed by the new, inventive ways to find embellishments on a card or a project. For these adorable stamp sets with the coordinating die sets visit Reverse Confetti. Laurie Schmidlin has out done herself again with this adorable card. Be sure to pop on over to see her wonderful projects on Just Give Me Stamps. 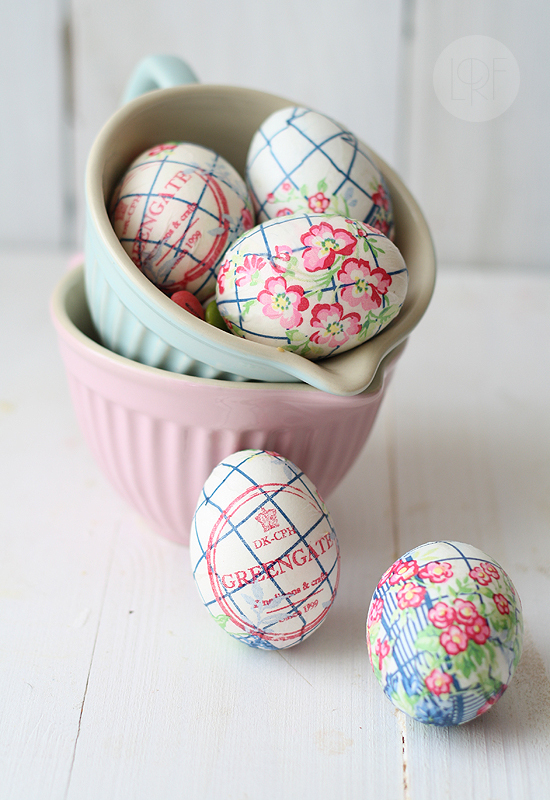 Who would have ever thought to decorate Easter eggs with paper napkins? Are you ready to try something new this year? This is a less messy alternative to dying eggs. You may want to try this fun technique to decorate hardboiled eggs this Easter. This will be so fun and easy for your children, grandchildren (or even just you!) to create. You will have your family members blown away at the beauty of these eggs. Give it a try you will love the end result! These were created by Sandeea Cocina — click on over to her blog la receta De La felicidad for instructions on how to create these special eggs, plus more wonderful ideas. Let your imagination run wild! Last but not least today I have a cute Easter desert that will be so fun for your Easter dinner. 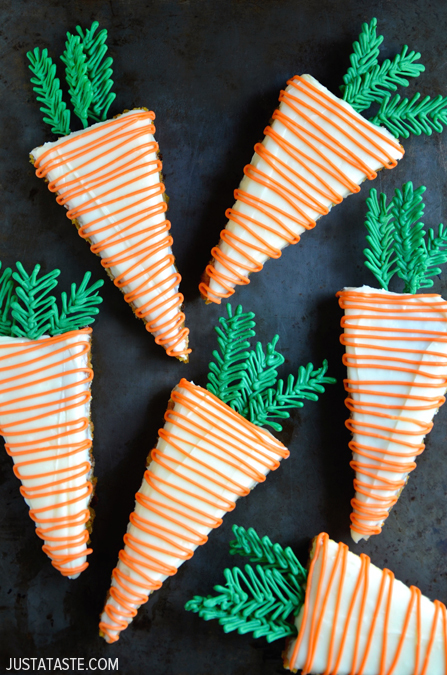 These yummy Pineapple Carrot Cakes with Cream Cheese Frosting will definitely make your family ask for seconds. You can enjoy your fruits and veggies all in one serving of cake! The little carrot cakes are very moist with a dense texture, and the full flavor of pineapple and carrots. So different and very fun for Easter! You will hear nothing but wonderful comments as you bring these to the table! To find more fun recipes go to Just a Taste with Kelly Senyei. You will be amazed at her talent in the kitchen! I hope today has brought you some fun Easter inspiration, and that you are feeling excited and ready for Easter Sunday! Thank you for sharing your time with me today. Happy Easter to you all! This entry was posted in At Home, Card Making, Recipes, Saturdays With LeAnn, Scrapbooking, Stamping and tagged Create Well Create Often, Decorations, dessert, Dies, Digital Downloads, Easter, Easter Eggs, Easter Kids Button Card Digital Collage, Ginny Nemchak, heidi swapp, Jen Evans, Just A Taste, Just Give Me Stamps, Kelly Senyei, la receta De La felicidad, laurie schmidlin, Layout, Minc, Paper Napkins, Pineapple CXarrot Cakes with Cream Cheese Frosting, Polly's Paper Studio, really reasonable ribbon, Reverse Confetti, Sandeea Cocina, Stamps, Wanderlust Collection. LeAnn, in 2014 you shared, I believe it was a card, that had ascending butterflies in three different sizes and colors. Somehow I lost mine and was wondering if you could send it to me, repost it, or tell me where I can go and find it please. I think it is so beautiful. Thank you very much.